Trafficking in persons is a violation against human rights. It involves the act of recruiting, transporting, transferring, harbouring or receiving a person through the use of force, coercion or other means, for the purpose of exploitation. Virtually every country in the world is affected by trafficking for sexual exploitation, forced labour, servitude, and removal of organs as a country of origin, transit or destination. Every year, thousands of men, women and children fall into the hands of traffickers, in their home countries and abroad. While estimates of the number of persons trafficked vary, ILO research indicates that an estimated 20.9 million persons, around 3 out of every 1,000 people globally, are subjected to forced labour. Even this staggering figure is largely considered a conservative estimate given the clandestine nature of the crime, and the strict methodology applied. The Asia-Pacific region records by far the highest rates of human trafficking in the world. The same ILO report as mentioned above, estimates that some 11.7 million people from the region are in conditions of forced labour at any given point in time. UNODC’s 2012 Global Report on Trafficking in Persons demonstrated that, while human trafficking is truly a global phenomenon, it most commonly occurs intra-regionally, with each region and sub-region experiencing unique and geographically-characterized patterns for origins and destinations. The Republic of Korea is a member of the Bali Process on People Smuggling, Trafficking in Persons and Related Transnational Crime (Bali Process). Since 2002, the Bali Process has effectively raised regional awareness of the consequences of people smuggling, trafficking in persons and related transnational crime, and developed and implemented strategies and practical cooperation in response. This voluntary forum includes 45 participating countries, as well as IOM, UNHCR and UNODC. The core objectives of the Bali Process are to combat people smuggling and trafficking in persons by developing more effective cooperation and information sharing between Bali Process members and other relevant organizations; to raise public awareness and educate vulnerable population about the crime of people smuggling and trafficking in persons; to build capacity across Member States and facilitate the sharing and implementation of best practices; and to advance the facilitation of the 2011 Bali Process Regional Cooperation Framework as a means of adopting a comprehensive and holistic approach towards combating people smuggling and trafficking in persons. The Regional Support Office of the Bali Process (RSO) was established in 2012 to operationalize the Bali Process’ Regional Cooperation Framework (RCF) to reduce irregular migration in the Asia-Pacific region. The RSO is the only cooperation mechanism of its kind in the Asia Pacific and aims to support and strenghten practical cooperation on refugee protection and international migration, including human trafficking and smuggling. These activities are supported by the knowledge, expertise, and experience of Member States and international organisations, including IOM and the UNHCR. CIFAL in affiliation with UNITAR has become a knowledge hub and platform for promoting city-to-city cooperation. Through this approach, CIFAL directs its capacity building efforts towards local actors. CIFAL Jeju / Jeju International Training Center (JITC) focuses on the thematic area of social inclusion, especially focuses on the human trafficking issues which impact on the capability of human beings to drive their own lives and decide their own future. Cities in the Asia-Pacific region can substantially improve the situation by focusing and sharing experiences on the prevention of trafficking, prosecution of traffickers and the protection and reintegration of victims of trafficking. Therefore, this training aims at strengthening the role of local authorities and actors in the Asia-Pacific region to better identify and protect victims of trafficking.
? National and local government officials and other related personnel from NGOs who directly work with the victims of trafficking from Cambodia, Laos, Myanmar, Vietnam, Thailand, Indonesia and Malaysia.
? Each country has a quota of three persons; one for a national government official, one for a local government official, and the last one for a NGO worker. ** Participants are expected to work in the related field for at least two years after the workshop.
? be able to build professional networks, exchange information and knowledge. UNITAR-developed "CityShare methodology" will be used during the workshop. The "CityShare methodology" aims at optimizing peer learning between local officials and other local stakeholders playing crucial roles in ensuring sustainable municipal development. The methodology consists of various processes of self-assessment, distillation, and transfer of challenges, lessons learned, and good practices between local stakeholders and resource persons. It is also composed of several tools to provide a common framework for the evaluation of experiences made by the participating cities and offer a common language for the exchange and assimilation of experiences, as well as a roadmap for action and progress.
? Submit necessary documents on time, i.e. , registration form etc.
? Complete and submit pre-training readings and assignments, i.e. self-assessment, case study presentation, etc.
? Actively participate in the workshop program.
? Be fluent in written and spoken English. 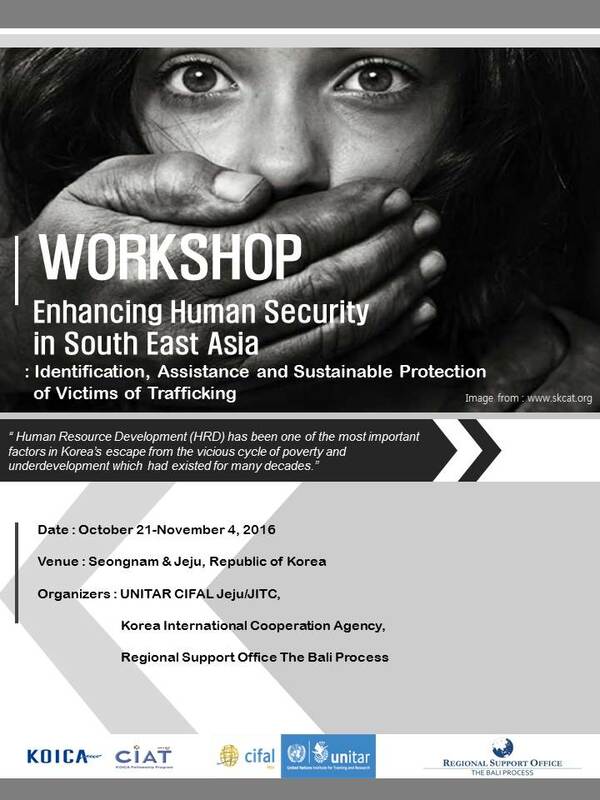 KOICA and UNITAR CIFAL Jeju will jointly issue a certificate upon completion of the workshop program.
? Application without required documents will NOT be considered.
? Participation is subject to approval of the application by UNITAR CIFAL Jeju.
? Selected applicants will be notified individually.
? Round trip airfare from home country to Republic of Korea will be covered by KOICA.
? Local expenses (transportation, accommodation and meals) during the workshop will be covered by KOICA.
? Fixed visa fee (KRW 60,000) will be reimbursed after arrival at Korea by KOICA.
? All other expenses (local transportation in their country) are the responsibility of the participants.